Autumn is officially here so it’s time to update our list of key trends. 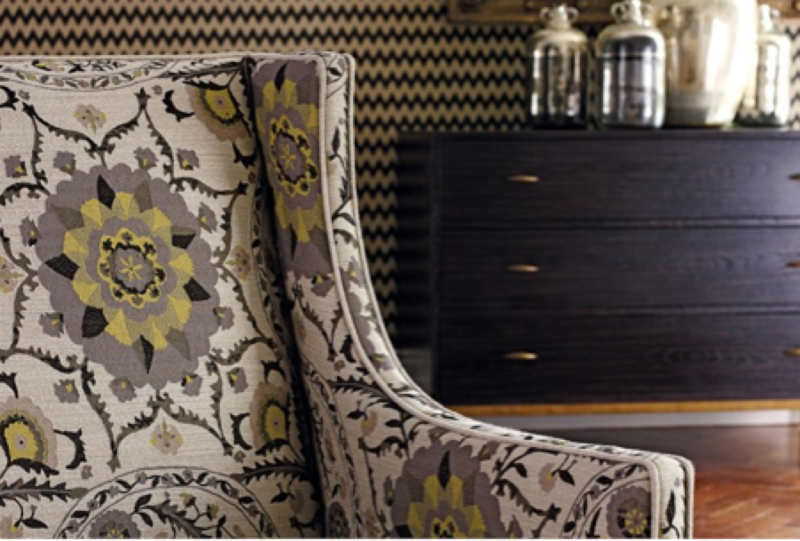 As a designer it is great to see that colour and pattern back in fashion. Our homes have moved away from the magnolia of the 90’s and back into colour. 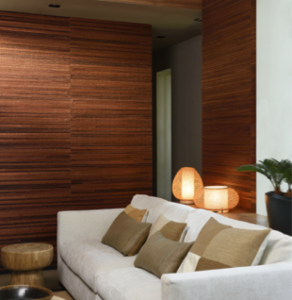 Coppery bronze tones are very popular in wallpapers and fabrics this season. It’s the perfect colour for autumn and very sophisticated. Arte have launched a new copper wallpaper in the Caribou range which is made from dried banana leaves. For interior designers, blue is the most versatile of all colour groups. We saw new paint launches from Zoffany and the Little Greene Paint company this autumn. 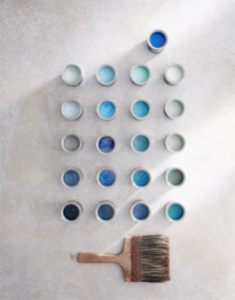 The palette encompasses a wide spectrum of tones, from confident indigo to calm linen hues, dispelling the myth that blue is always a cold colour. Boho has been constantly in and out of favour in the fashion industry and this season saw several large launches in interiors. Nina Campbell launched a fabic called Pachinko, inspired by her travels and Sanderson launched a boho range called Sojourn. It is a look that can date so I will be using it sparingly. 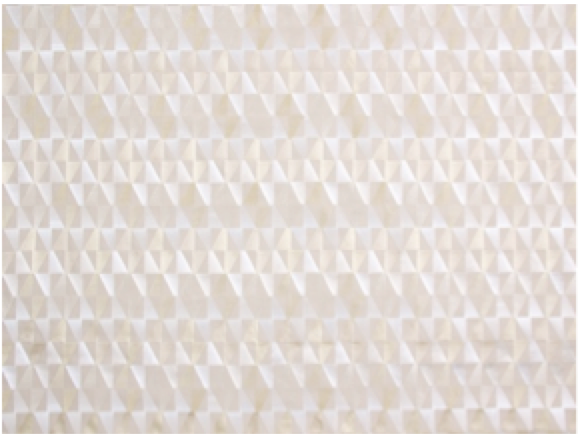 Geometrics have been a strong trend for a several years, especially in contemporary fabrics. 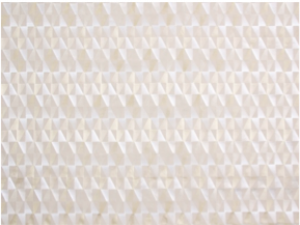 It is nice to see more geometric patterns in traditional fabrics this year. Hodsell McKenzie, one of our favourite British classic fabric houses has launched some sophisticated geometric weaves. 5. Fabrics with extra large patterns. Many fabric houses are working with artists to produce very creative images on fabrics. They have chosen larger pattern repeats to show them off to full effect. 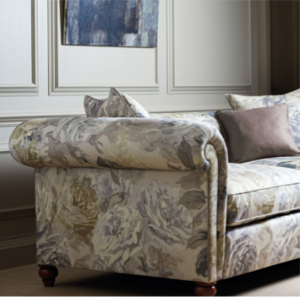 The new Winterbourne range from Zoffany incudes 3 fabric with huge patterns. They look really dramatic hung at large windows or upholstered onto furniture. 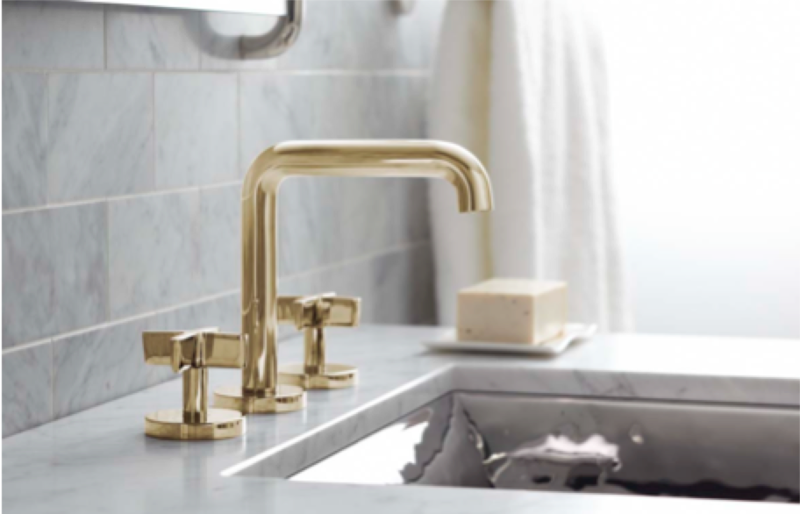 6 Bathroom hardware in a range of finishes. Gold, black, copper, stainless, gunmetal, white…. everyone used to buy chrome but we have had quite a lot of enquiries recently from clients wanting different finishes in their bathroom. While there are lots of options available in the US the UK industry is finally catching up with demand. 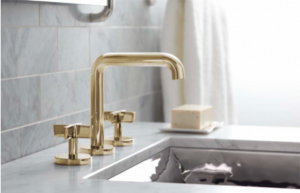 Kallista, an American supplier, has a range available in brass and gunmetal finishes.